"Caesar II takes place in Ancient Rome; when the game begins the Roman empire extends no further than Italy. Players have the opportunity to civilize adjacent barbarian provinces, eventually reaching the entire Roman Empire at its height. When a province is civilized it unlocks the surrounding provinces. 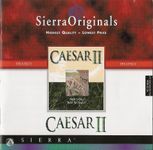 A computerized rival also completes missions both preventing the player from civilizing that province and allowing them to civilize the provinces adjacent to it"
Source: Wikipedia, "Caesar_II," available under the CC-BY-SA License.